By Congressman Earl Blumenauer of Portland, Oregon. 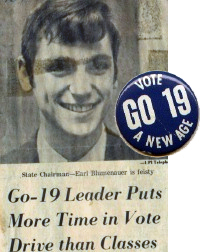 Earl Blumenauer led the campaign in Oregon to lower the voting age to 18 years old. After being in a dozen states watching the mud and the accusations fly, I thought I’d reach the point where nothing in this election would surprise me. I thought I’d pretty much seen it all even in Oregon. However, last week coming back from my last campaign trip, I was frankly shocked. At the Statesman Journal Open Editorial Board, Ron Saxton said that he was a leader in Oregon’s campaign to lower the voting age as a student at Albany High School and Willamette University. I was a little taken aback because I organized, chaired and devoted several years of my life first to the state voting age campaign, and then the national ratification of the constitutional amendment for the 18-year-old vote. Having known Ron for over 20 years and worked with him back when we used to agree on things, it seems strange that he never mentioned our connection. I wondered how this could be? During 1969–70 statewide campaign, Ron was a high school sophomore, and I am sure somebody that young who was playing such a prominent leadership role would have stood out. I am stunned that I do not remember. I know exactly who led the campaign in Albany. It was not Ron Saxton, it was the Student Body President, Laurel Lunn. This energetic and effective young woman headed our local effort and worked with me on the statewide campaign. I suspect that if we had some hot shot high school sophomore leading with her, I would have noticed during my trips to Albany. Had I known that Ron Saxton was a leader in lowering the voting age, I could have used his help in the 1971 Legislative Session, because one of the key votes was Bud Beyers, a state representative from Linn County. Bud subsequently paid a tremendous political price for voting with us, abandoning a written commitment to then House Speaker and later Congressman, Bob Smith. If I had know that Ron Saxton was a leader in our effort (and was a constituent of Bud’s as well), that would have been of tremendous help in working with Bud and protecting him during reelection. Even more curious is his claim that he was a student leader for lowering the voting age while attending Willamette University. Ron didn’t arrive at Willamette as a freshman until the Fall of 1972, 15 months after we ratified the amendment in 1971 Legislative Session. Was he somehow active at Willamette, a year before he was accepted as a student? However, it’s interesting that he would claim something that would appear so clearly inaccurate. It is one more sad example that the Ron Saxton who is running for Governor is not the Ron Saxton some of us thought we knew over the last 25 years. Thanks for letting us know, but you're way too polite. Call the liar a liar. Saxton's willing to lie about his background. What else would he lie about if he was elected to public office? i buy all of my electronics from nigeria. Haven't seen the might "O" reporting this. Must not want their endorsed candidate for governor to look too bad. So are we to take this to mean that when "The O" says the state needs change they mean they want to exchange an honest governor for a liar? This could be another "values" election. Wow, what a sleazeball Ron Saxton has become. Can we turn this into a quick little T.V. ad to show the electorate exactly how far his moral principles might extend, or would that just be too negative? I have it on good authority Ron was actually in the Alabama National Guard at that time. For what it's worth, the Right has also clearly noticed Saxton's inability to tell the truth, or to be consistent. They may wish to close ranks around him, but they are clearly holding their nose if they do. Here's an excerpt: "For there is the unique way in which Mr. Saxton has been able to take both sides of various issues. Conservative when speaking to conservatives yet liberal when voting or speaking to liberals." The article documents many examples of Saxton's forked tongue. In short, a vote for Saxton is a vote for a weather vane. More's the pity. It seems that Saxton's swing to the right has brought him to embrace the faith based concept of truth: if I believe it, then it's true. This approach to reality has served conservative Republicans well for a few decades. Saxton might as well catch the wave before it crashes on the rocky shore of utter policy failure. That's in six days by my reckoning.